Since 1970, when Charles Kelman introduced phacoemulsification in 1970, modern cataract surgery has been a continuous quest for the most fitsuitable methods to reduce ultrasound and surgical times necessaryrequired for lens removal. 1, 2 Reducing ultrasound time means reducing the damagedamages to a unique and irreplaceable structure: - the corneal endothelium. TheAkahoshi's pre-chop technique of Akahoshi is based on the accurate study of the lens anatomy and of its possible division lines, and was originally a monomanual technique. 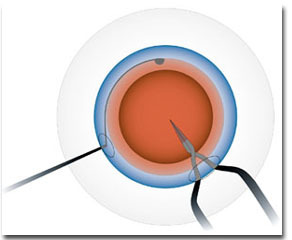 In 1998 Dr. Carlo Vanetti has developed a bimanual version of this technique, called Bimanual Instant Cracking (BIC). 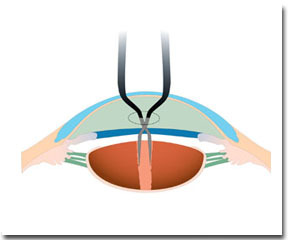 It was called Bimanual to highlight the simultaneous use of two instruments: the nucleus holder for immobilization of the lens, and the cracking forceps. The nucleus holder is a blunt hook with a double curve, built to follow the lens convexity, and featuring a round, atraumatic tip. 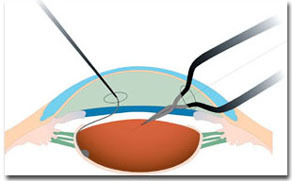 The holder makes it possible to immobilize safely the nucleus during the cracking phase, at the same time warrantwhile ensuring complete lens visualization. The cracking forceps feature crossed arms and slim, sharpened tips to penetrate easily in the central portion of the nucleus. After the usual viscoelastic injection, complete capsulorhexis and hydrodissection, viscoelastic is again reinjected to offer optimal visualization and stability of the anterior chamber. It is essential to prevent nuclear rotation in order to achieve a better visual control. Bimanual Instant Cracking (BIC). Insertion of forceps deep in the nucleus, while nucleus holder sustains and immobilizes the nucleus. Bimanual Instant Cracking (BIC). First cracking.